See if you can help me here. Do any of you use Mylar when you sew? We have a customer who uses it to hand stitch "fussy" quilt squares? They look like flattened hexagons to us. Sorry, I do not have a pic yet. I also see folks selling these online with a acrylic hexagon and a bag of 20-25 of the mylar flattened ones. This product is also often used for stencils. Please let me know your opinion on this and if you have made any projects with it, pictures would be great! I occasionally use it to make templates or stencils for certain projects. They have two kinds, that which you can iron over aka heat resistant and that which is not heat resistant. I mostly use it when I want a small stencil to trace as a pattern for quilting on small projects. Thanks. This is heat resistant. It is 14 mils thick and seems pretty durable. The ones I have seen have a hole in each one to make it pop out easier after you have stitched the next outside grouping. Not sure if this makes sense or not! We could also laser cut a stencil before selling. Ah, I know which ones you mean. I don't do hand sewing so I don't use mylar for that. But I can see where it is very handy for those hand sewing small hexies. I know a lot of people use paper, English paper piecing is very popular. I would think using the precut mylar would cut down on a lot of time and labor. It has to take a while to cut out all those paper hexies. And since mylar is reusable, it is more eco friendly. That might be a good selling point. The product I like the best is Templar Plastic. It is expensive. Well, in my head it is. About $2.25 to $2.50 for 8-1/2 x 11 sheet. I use it for applique. It needs to be heat resistant. Haven't used mylar at all. I use "dead" Xray plates from my doc for templates..when I don't use paper printed from my computer. I checked the Templar, it is expensive. And, they say it is heat resistant but I could not find the actual temp tolerances. Most sites said to use a dry iron on low setting. Soooo, I got a sample of our 14 mil stuff (as a comparison most stencils you see online are 7 mil) and we cut a piece. I got my trusty iron and a laser thermometer and gave it a try. The first 3 settings of my iron are all under 300 F and caused no problem. The spec sheet on this stuff says 302F and above may start to give you a problem but you should not need anything that hot to set a seam. All in all it seems to work well and held up! Here are some pics of a diamond set up that one person uses. She cuts out the fabric with the acrylic diamond, then uses the Mylar to sew around and iron down the seams and then removes the Mylar. I imagine you could use any shape. Do any of you do this type of thing? Would selling these in a set of maybe 25 Mylar + the 1 shaped acrylic be something that folks would want and how much do you think it would be worth? Well as an update, these seem popular. We were asked to make others. This one is a hexagon set. These sell for 17.50. May add some others when my designer speeds up! 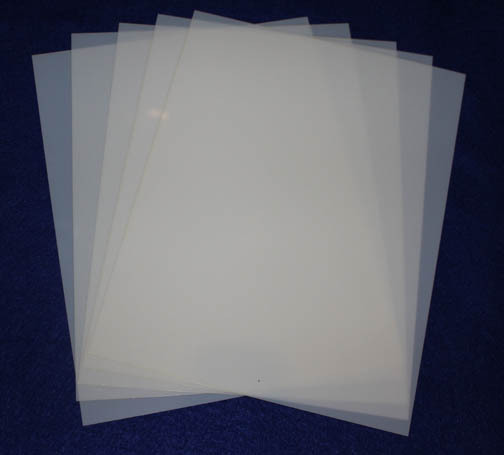 Just starting offering sheets of 14 mil Mylar for sale. This is the good thicker stuff. We have out there 5 sheets of 8.5 x 11 inches for $13. As always if anyone here would like some, you can PM me and get a better deal! We are also going to try and get some pre cut stuff done as well in the near future. Hmmm. Not sure when/how I missed this. Very interesting. how many mylar hexies are in the set?. I have been using your hex template and making hexies to pass time while I watch the canner.